A prosthesis is an artificial body part and people with a limb difference often wear a prosthesis to replace all or part of an arm, leg, hand or foot. A prosthesis is used to replace the function of the missing limb and/or is used for cosmetic reasons. The plural term for prosthesis is prostheses. A prosthesis may be used by a child born with a congenital or acquired limb difference. Do all children wear prostheses? No. Not all children wear prostheses – every child is different. Some will wear a prosthesis for the majority of their childhood, adolescence and adulthood. Some children will only wear a prosthesis for certain periods of time and others may only wear a prosthesis for specific activities. Some children will never wear a prosthesis. The decision about whether or not your child is prescribed or will wear a prosthesis is due to many factors – their age, development and activity level, the type and level of limb loss, their acceptance of the prosthesis, and willingness to learn how to use it. How does my child receive a prosthesis? In most Australian states and territories, basic prostheses are paid for by the government through public hospital funding. If more specialised prostheses are required there may be out-of-pocket expenses and you should discuss any potential costs with your Prosthetist. If your child has lost a limb as a result of certain accidents (such as a car accident) your child may be entitled to funding via insurance in your state or territory. If your child does require a prosthesis a number of specialists may be involved in the decision making and planning process. Such specialists could include a Surgeon, Prosthetist, Physiotherapist and Occupational Therapist who will discuss options with you and your child. More detailed information about accessing prostheses can be found in the Funding section of this website. What is involved in finding and fitting a prosthesis? A prosthesis is manufactured, fitted and maintained by a Prosthetist who has completed specific University training in this field. Appointments with your child’s Prosthetist occur at a hospital or private clinic. This meeting will involve taking measurements and possibly a plaster cast of your child’s limb. This cast is then used to make a socket that is shaped to fit your child. The casting process does not hurt or take very long. After the assessment it may take a couple of weeks before you move to the next stage – the fitting. At this meeting your Prosthetist will place the prosthetic socket onto your child to ensure it is fitting correctly, isn’t causing any pain and possibly make some minor adjustments (such as length or height and, in the case of lower limb, alignment to ensure it is at the correct angle). At this point the Prosthetist will begin teaching your child how to use the prosthesis. When a child first uses a prosthesis there is a lot to learn, which can be challenging and tiring for both your child and you. If your child has a lower limb difference a Physiotherapist will assist your child to practice balance, walking and the development of positive gait skills. If your child has an upper limb difference an Occupational Therapist will assist your child to learn how to use their prosthesis for day-to-day activities. These meetings are required to adjust the prosthesis as your child grows. In most cases this is necessary at least once every two to three months initially and at lesser intervals as time goes on. When your child has outgrown their prosthesis, and cannot be adjusted further, a new socket is then made. 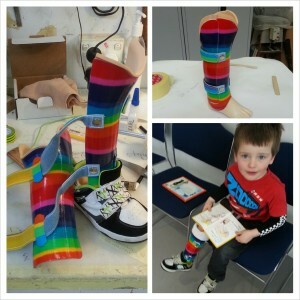 How to get the most out of my child’s prosthesis? Getting the most out of your child’s prosthesis is a big commitment because there are often many appointments, particularly during the early stages. If your child might benefit from a prosthesis make sure that both you and your child understand the associated benefits and challenges. Speak to your Prosthetist and other health professionals if you have any questions. Learning to use a prosthesis takes hard work. Even though it replaces some lost function, learning to walk with a prosthetic leg or learning to use a prosthetic arm can be challenging. Often it can feel quite difficult when your child first begins to use a prosthesis, so encourage your child to persevere. While your child is the one wearing the prosthesis, it is important that the whole family (and other friends and community members) play a part in helping your child to overcome any challenges. Attending regular review appointments is also very important. If the prosthesis is not adjusted to accommodate your child’s growth it may cause rubbing, sores and/or pain. Make sure that you and/or your child are regularly checking the skin and if any issues arise contact your Prosthetist.